CHARLOTTE HARBOR & THE GULF ISLANDS, Fla. (March 22, 2016) – Weekly, the Charlotte Harbor Visitor & Convention Bureau compiles and distributes a popular calendar of events listing called "This Week’s Happenings.” It lists various events happening throughout Charlotte County and includes information on festivals, dances, sporting events, stage performances, guided outdoor adventures, art and craft events, lectures, live music and more, including "boomerang events" which give visitors reasons to return. The comprehensive events calendar is distributed to area accommodations, chambers of commerce, businesses, visitors and residents. 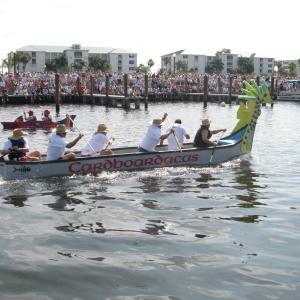 Organizations interested in having their event listed at no charge in the “This Week’s Happenings” and on the Charlotte Harbor Visitor & Convention Bureau website can submit their events online at www.charlotteharbortravel.com/events/submit-your-event. Events should be of interest for Charlotte County tourists and are published at the discretion of the Charlotte Harbor VCB. Currently, the Events section of the website receives more than 10,000 visits a month. Questions on how to submit events can be directed to Juli Pennock, Marketing Assistant for the Charlotte Harbor Visitor & Convention Bureau, at Julie.Pennock@charlottecountyfl.gov or (941) 743-1900.